When I first became “serious” about setting up a train layout, my "benchwork" consisted of an old ping-pong table that I found sitting in the attic that wasn’t being used any more. I’ve heard this same story many times from other model railroaders. Thanks goodness for ping-pong tables! I don’t know what would have become of the hobby industry, especially model railroading, without them! At any rate, it was a start. After I planted an oval track and then a figure eight track within it on the ping-pong table, I started expanding, building the benchwork as I went with no real planning. I used whatever wood scraps I had around to make connecting tables attached to shelves and then attached to more makeshift tables. The connecting tables were different sizes and basically consisted of 3 or 4 legs and a sheet of plywood or particle board or whatever I could find. I ended up with a rather large HO empire taking up the entire attic. I guess the benchwork held up okay although it didn’t look very pretty. Eventually this all had to come down so we could make a new, finished “train room” using part of the attic. When the new “train room” was finished, my family decided they wanted to put a pool table in it. That’s what we used it for - for several years - while I was relegated to using other smaller areas of the house to build layouts. After a while, the pool table didn’t get used any more, so again I petitioned for use of the “train room” for actual trains, which was ultimately approved. I covered the top of the pool table with a 4’x8’ sheet of extruded foam to protect it and put a sheet of plywood the same size over the top. I wanted to protect it well so that if we ever moved, the pool table would still be in good shape and could potentially either be moved or sold with the house. I then purchased several modular wooden kits from Woodland Scenics including 3 corner modules and 5 straight modules. I had already been planning my new layout for months, so I knew exactly how many kits I needed and where they would be placed. After each section was put together, leveled and bolted to each other, I placed a cut piece of plywood over each section so that there would be a 2 inch overhang in the front of each section. I placed sheets of extruded foam – measured and cut to fit – on top of each section. I tried to keep the plywood sheets and extruded foam sheets cut to fit each section separately, so that if I ever have to move, the sections could be more easily separated. The benchwork with the plywood and several sheets of extruded foam on top brought the level of the layout surface up to about 36”, which I think is a good height for me. 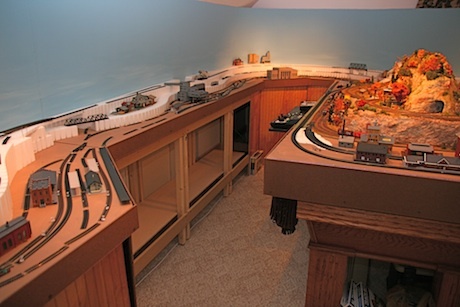 I know many model railroaders like to bring the layout surface up to about 40” or higher in order to bring it up to eye level, which is best for viewing. I personally thought that was too high for me. I didn’t want the discomfort of having to work over a high layout surface with my arms up at eye level for long periods of time. The bird’s eye view is okay for me while I’m standing. If I want an eye level view, I can just sit on one of 3 chairs that I keep in the room. I’d rather be sitting when I work on the layout anyway. When the framework was completed, and after the subroadbed was added (plywood and foam sheets), I purchased several sheets of paneling to use for the front of the benchwork. I measured and cut these so they would fit under the overhang and so that I could put them on grooved sliders fastened to the floor. This way, I can have sliding doors over the front of the layout and use the inside for storage. ~ Your benchwork needs to be designed around your basic layout plan. ~ Make it so that it compliments rather than detracts from the artistry of your layout. Shoddy construction and having a lot of stored items visible under the layout don’t really look that great. You want your visitors eyes to be focused on the trains and the layout, not all the junk you have stored underneath. ~ It needs to be sturdy enough to last for many years. If there are areas of the layout that can only be accessed by standing on the layout surface, make sure it’s sturdy enough for that, or better yet, create an access hatch in the middle of the layout so that you can duck under and come up inside the access area when you need to work on those areas far away from the aisle. ~ Speaking of aisles, make sure they’re wide enough for 2 people to comfortably pass each other. ~ Keep in mind that someday, it may have to be moved. From "BR&S Benchwork" to "Blue Ridge & Southern"
From " BR&S Benchwork" to "HomePage"